I’m writing this on 24th May 2018. The day after the new Data Protection Act received its Royal Assent and the day before the day we’ve all been waiting for, GDPR implementation day, 25th May. 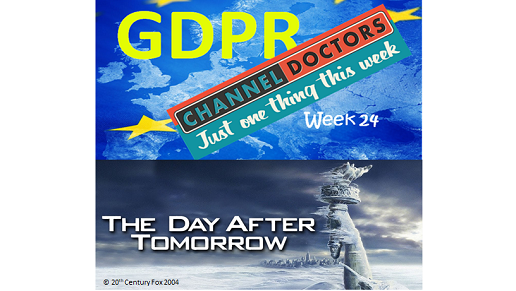 Don’t 24 weeks fly by when you’re having GDPR fun? This week I was intending to provide another bite-sized piece of advice to help you on your way to becoming GDPR compliant, especially from a customer experience perspective. However, as the nation has been floundering under a growing tsunami of last-minute ‘re-permission’ or ‘re-consent’ emails from companies, charities, arts and community organisations for the past few days, I can’t avoid looking at that phenomenon. An organisation’s legal ability to process – or continue to process – personal data is always situational. It’s subject to both the organisation and its data subjects’ specific context – and decisions the organisation must make about how it sees its role, in order to define its legal basis for handling personal data (i.e. consent, legitimate interests, performance of a contract, etc). That’s all a bit laborious to go into just now (though have a look at www.dma.org.uk/article/dma-gdpr-guidance-for-marketers), but suffice to say I think most of the ‘GDPR’ emails I’ve received in the past week were unnecessary – and potentially very damaging to the organisation sending them. If you have now just lost over 80% of your marketing data (a reasonable guess, for most organisations) after telling your customers that you will rely on their explicit consent to stay in touch with them, then even if you were to justify to yourselves a change in the legal basis to, say, legitimate interests [not impossible, but very difficult] you’re likely to find that’s a hard sell to the customers you just told wouldn’t hear from you again unless they opted in before 25th May! Keep up the good work and the best of luck in the post-GDPR world.